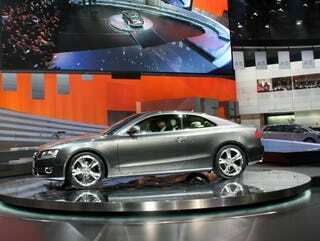 GENEVA — Audi's former chief designer Walter d'Silva told the gathered mob here the Audi A5 is the most beautiful car he's designed in his career. We're inclined to agree, considering the original Alfa 156 hasn't aged as well as we thought it would. Nonetheless, it can't be underestimated what an achievement the A5/S5 is in this age when designers generally have no clue what to do with a two-door model that's not a supercar. (We're looking at you, Toyota Solara.) Look for it parked in front of a 12th century apartment complex near you, beginning this summer.